It’s Thanksgiving here at GP HQ and not to sound too cheesy but thank you all for visiting our site and helping keep it going all these years. We have a full day of news coming at you, no rest for the holiday! And we’re kicking that off with a fresh round of news from around the web. The Beat – Marvel Watch: Joe Quesada steps in to smooth Cebulski transition, including interviews – Except an interview with us. No way that’ll happen. Publishers are scared for us to interview their CEOs and EICs. The Beat – Five more women accuse Berganza of sexual harassment – The tip of the iceberg. Kotaku – Marvel Heroes Developer Gazillion Apparently Lays Off Everyone On Thanksgiving Eve – What assholes. 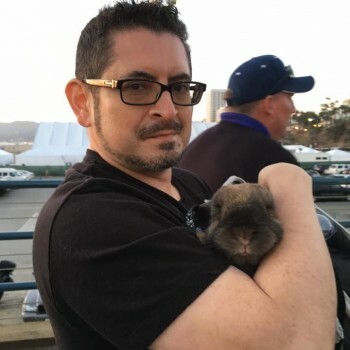 DC Entertainment has fired editor Eddie Berganza after assault and harassment again was raised. Buzzfeed released a detailed article covering the multiple incidents by Berganza which included harassment and assault. Numerous articles concerning the incidents have been written for years without ramifications or result until this weekend when it became more high profile. Berganza joined DC Comics in the 1990s and the Buzzfeed report has incidents going back to the early 2000s with the most recent in 2012. During that time he was promoted and demoted and enabled to continue while women were punished in various ways. Over the weekend Berganza was suspended pending an investigation with word of his termination being confirmed today after the rumor surfaced he was this Sunday. 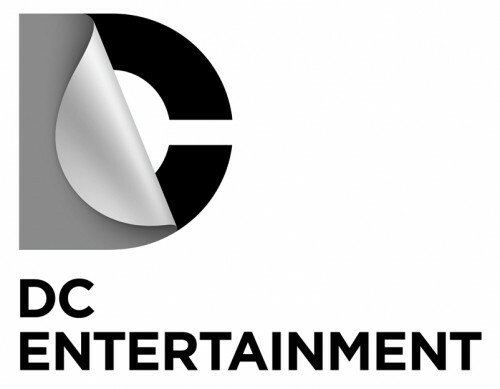 An email has been sent out from DC Entertainment that Group Editor Eddie Berganza has been suspended and removed from performing his duties. Berganza has once again been at the center of past harassment at the comics publisher. Buzzfeed published an in-depth article on Friday which reignited the discussion about the lack of action on DC’s part leading to a new round of coverage as well as creators and more adding their voice and concerns over the continued employment of the individual. With the line feeling like it’s finally being drawn and more and more speaking out about harassment everywhere creators are coming forward in signs of support and also taking a stand. Rafael Albuquerque is taking a stand with after the recent Buzzfeed article laid out in detail the failure of DC Comics and Warner Bros. leadership to adequately handle ongoing harassment by editor Eddie Berganza. Albuquerque is an award winning artist who has worked for DC Comics, Vertigo, Marvel, Dark Horse, BOOM!, Oni Press, and Image Comics. For DC he most recently worked on All-Star Batman, but also worked on Animal Man, Batgirl, Batman, Blue Beetle, among others, as well as American Vampire for Vertigo. I love DC Comics characters since I can remember. First watching them on TV then with Batman movies and those definitely brought me to comics, where I could find my voice, my home. Having spent almost my whole career working for this company made me feel part of a family. That’s how important DC Comics is for me, and I believe that I can speak for many creators who have similar paths. Maybe, by writing this, I might be jeopardizing my career over there, but I can’t just stay silent about what happened with our colleagues who reported sexual harassment. They probably had the same feeling about DC Comics, and probably felt the same way I did when they became part of the family, and suddently their careers were harmed by someone who just didn’t realized, respected or cared enough to understand that a power position is a privilege that must be used wisely and fairly. DC Comics, you mean the world to me, but it’s time for you to make the right call, not just for your image, but also to show that there is no place for this kind of behavior in this industry and neither in our society. I spent the whole day afraid to speak out. I shouldn’t and I won’t anymore. Neither any professional should be anymore. It wasn’t long after the news of the firing of Shelly Bond and restructuring of Vertigo by DC Entertainment that folks begin questioning why someone like Bond was let go while others in the industry who have histories of sexual harassment keep their positions. One of those people mentioned specifically was Eddie Berganza, currently the Group Editor for Superman titles at DC Comics. I had known of the incidents for some time, but with everything of its nature things always need to be researched, checked, double checked, get permission from those who recount stories, check those stories, etc. etc. Covering this sort of issue was nothing new for the site, but there’s right ways to do it, and I like to try to do it the right way. So when people decided to name names it was absolutely time to write what was known as now it wasn’t just an open secret, it was just open. And I pondered all day as to what to write, then I didn’t have to really write anything, because there’s two solid pieces that you should read that covers it all. Rich Johnston at Bleeding Cool does an excellent job of recounting the incidents, the facts, the fall out, everything you need to know about it. And he fills in some gaps I didn’t know about. Credit where credit is due, he nails it with facts. Then Heidi MacDonald at The Beat also posted an article that is an fantastic companion piece to Johnston’s post. When it comes to the details, I have nothing to add, and they do a much better job than I could have. What I will add and state is that harassment is still pervasive in geekdom whether in offices, at conventions, or in stores. It should not be tolerated, accepted, or swept under the rug. We as an industry and as fans should be aware it is present, and do everything we can to help make comics an inclusive and welcoming place. Ema Lupacchino is a relative newcomer to the comic book industry, but she has already made her mark. With over 100 issue credits to her name, she has already worked on a lot of iconic comic characters including Thor, Vampirella and Lois Lane. 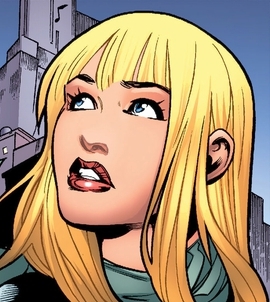 Since issue #30 of Supergirl she has been the series’ regular illustrator. We got a chance to talk with her about her work on the title, designing battle armours, and choosing the right colour of nail polish. Graphic Policy: How did you get the chance to draw this iconic character? Ema Lupacchino: From what I remember, It happened in just three seconds – Eddie Berganza asked me if I’d have liked to work on Supergirl and I said “YES”. I was really happy when he named “Supergirl” as the title I could have been working on, I love this character. 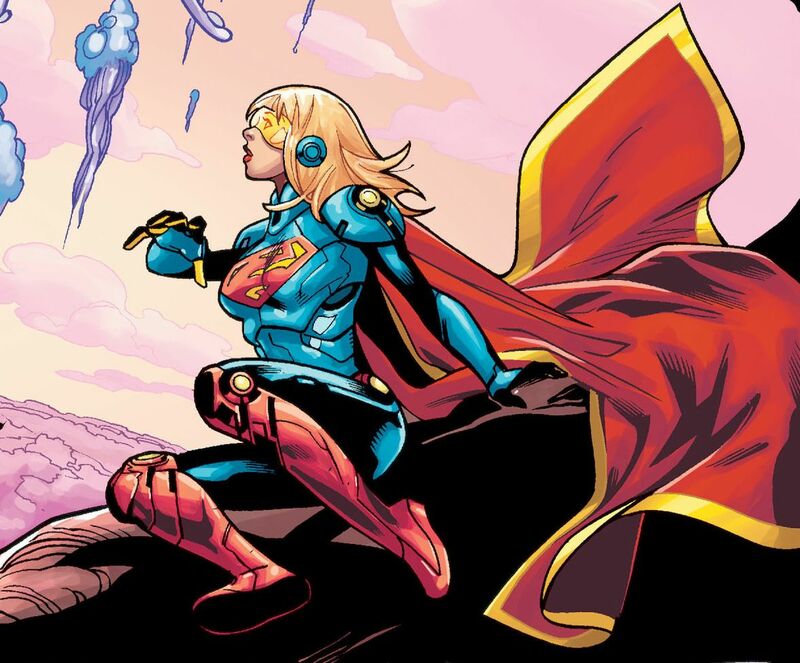 GP: Supergirl is fairly iconic in terms of her costume and her design, What do you do to put your own personal touch on this character? EL: What I think is that the costume is not really important in order to define a character – the key is the attitude I give to her. I feel this responsibility every time I have to feature a specific character with the acting, the gesture, the expressions – it’s what describes him or her the most, the costume is just an outfit. This is what I try to give to her, a very specific temper and attitude. It can be a look, a way to move, a feeling. I want her to be as “real” as possible. 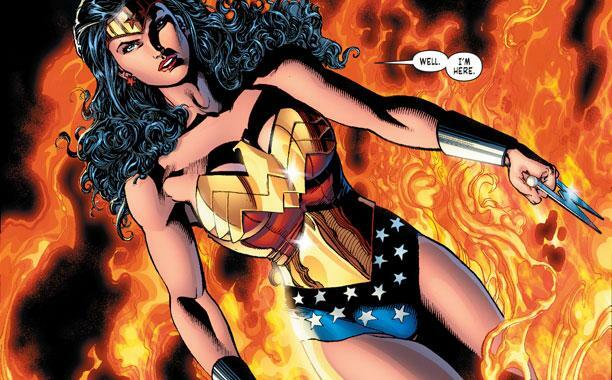 GP: Along with Wonder Woman, Supergirl is one of two major DC Comics heroes who are both very strong and very feminine. How do you find the balance between the two? GP: In the most recent issue (#36), Kara is wearing Supergirl-blue nail polish, which is a nice touch for the character. Did you have any input into that? EL: YES! It was me, I confess! I love blue nails, and since it’s more modern that the classic red one I thought it could be a smart way to show she’s living our timeline. 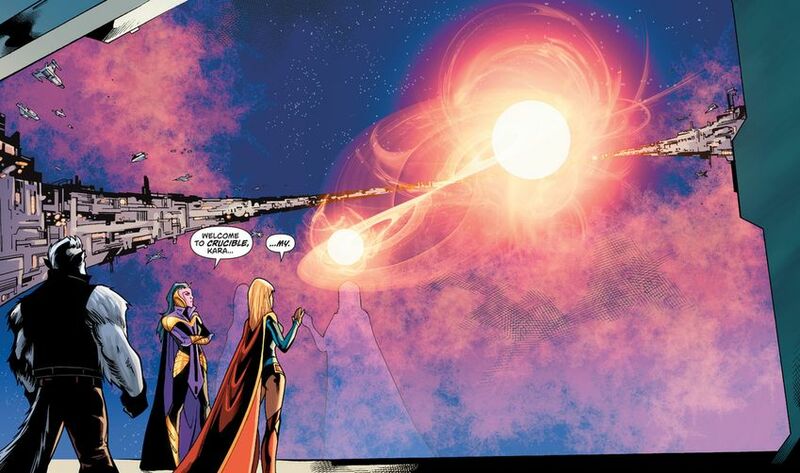 GP: Also in the most recent issue Kara is thrown into some Kryptonian battle armor, which looked pretty amazing. What were your inspirations for the design? EL: I was inspired by some pretty amazing concepts, mostly by Japanese illustrators I really love, like Terada for example. Japanese are the best at conceiving sci-fi technologies and I wanted to give a sense of futuristic tech on her armor, in order to help her feel light and comfortable at the same time. GP: The series has generally been a mix between Earth based stories and outer-space cosmic stories. Is there a setting between the two that you prefer? EL: Space, of course! On Earth, as our real world, nothing extraordinary really happens – but out there in the space, extraordinary things can be discovered: futuristic technologies, new worlds and races that are very exciting to draw. GP: Speaking of outer space based stories, the world which you designed for the Crucible is pretty complex and amazing, between the different environments and an awesome looking space station. How much input did you get into the design of the planet? EL: The idea of the Crucible as a bracelet orbiting on two twin stars was written in the script, and I think it’s a very cool idea. I spent a lot thinking about how to design it. You know, there were many factors to consider out there – the balance it should have with the stars’ orbit, the dimension, the details, the dimension of the ships outside. At the beginning I was working on some preliminary studies that didn’t really give the sense of its size, so I asked my friend Emiliano Santalucia to help me in figuring out what wasn’t really working with it. So he suggested to me to draw a huge diameter bracelet in which we can barely see where it ends over the stars. That worked perfectly, thanks Emil! GP: Are there any superhero characters that you would like to get a chance to draw that you haven’t already? EL: Good questions, I have TONS! :D I really wouldn’t mind to draw Catwoman or Wonder Woman one day. Superman #19 gives us a WTF certified gatefold cover where we see Wonder Woman holding him back as he wipes blood from his mouth, surrounded by rubble. When you open the gatefold; there stands Orion, gripping Superman’s cape in his hand, hovering above. There is a lot happening in this book with plot elements setting up future stories and Scott Lobdell is really starting to have fun as he’s settled in quite nicely shaping the Man of Steel’s comic book world. I really enjoyed the dialogue in this issue with the exception of one thing. There is a scene where Superman is talking out loud to himself about what he did and what he’s going to do. This seemed a bit like the old Super-Friends cartoon where he would spell things out for the viewer at home who didn’t know what he was capable of. He’s Superman, what can’t he do? Anyways, I thought this would’ve been a great opportunity to show off some narrative skills, but Lobdell chooses to let Superman talk out loud to himself. Also, Perry White is highly enjoyable in a J.K. Simmons sort of way. If this is the way Lobdell will continue to write him, we need more Perry! Kenneth Rocafort is quickly becoming one of my favorite artists. When Jim Lee decides to retire from drawing (which I hope his hand falls off before that happens), Rocafort could be my go to guy. His style fits this genre perfectly and the perfect adjectives escape me right now. He doesn’t use traditional panels as they splash all over the page with really unique framing that screams science fiction. The colors by BLOND are well blended, especially in the beginning where we get a glowing effect from Superman’s foes. The blur effect from anything happening at super speed in the book are nicely done as well. It seems like the Superman scenes have very ‘busy’ backgrounds, while Clark’s backgrounds are more relaxed and simplified. I really enjoy that symbolism in the art. The setups. This book gets the ball rolling on future plot points, not only by introducing Hector Hammond, but the Allysun and the people made of red sun particles. These will provide some great stories to tell in the future. Not to mention the discussion of Lois and Jonathan’s ‘soon-to-be’ roommate. That will definitely be something to keep an eye out for. I can’t imagine how that can end well for anyone involved. Superman’s need to talk out loud to himself. I really think at times the story could benefit from some narrative, rather than hearing him talk to no one. As I mentioned earlier, it seems a bit on the campy, cartoony side of things to have Superman talk about using his powers to do something. I would love a little box, that describes what’s happening and why. Remember those? Remember when comic books provided narrative and told a story rather than the characters setting it up for us? Then later we get thought bubbles! So, why is he talking out loud to himself at one point…but later decides it’s better to keep his thoughts to himself. This back and forth is a bit strange to me. “Honestly, if I didn’t have three ex-wives to support and a prostate the size of the weekend edition, I probably would have joined you when you walked out that door, kid.” – Perry White during a ‘heart-to-heart’ talk. If this is how Perry is going to be…we need more Perry! 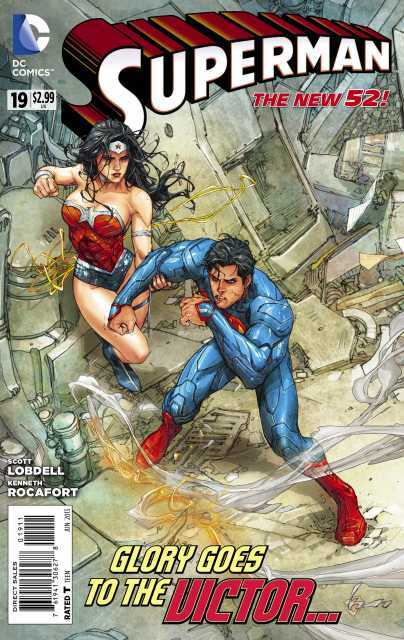 This book is a must have if you’ve been reading Superman already, I don’t need to tell you that because you already understand how great Lobdell and Rocafort have been together. But if you haven’t been reading, and are looking for a place to jump on board, this is a great place to start. With new villains, old villains and hints of things to come this book is setting you up for a great future run.